These vintage style wedding flowers at Coworth Park are one of my favourite colour combination of last summer’s weddings. An easy mix of ivory, blush, vintage pinky lilacs and a few accents of silvery green, this would be a versatile colour floral colour scheme to suit many weddings. Tracy chose this for her plum wedding, but equally it would look really at home against ivory, nudes, neutral sage or silver, or vintage pinks or lilacs… It was a really versatile look arranged in a really relaxed and yet elegant way, and it suited the venue very well. 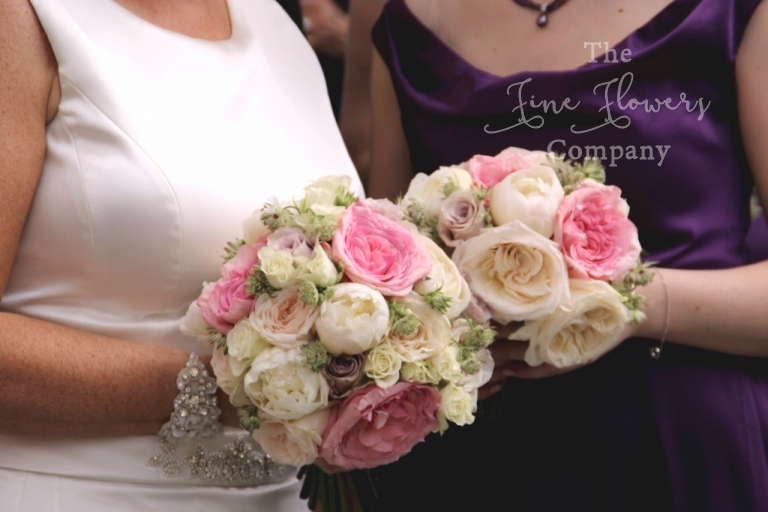 For her bridal and bridesmaids bouquets, Tracy opted for a mellow mix of beautifully scented white and pink O’Hara roses, paeonies, Memory Lane roses and astrantia, for a slightly wilder, textural look. 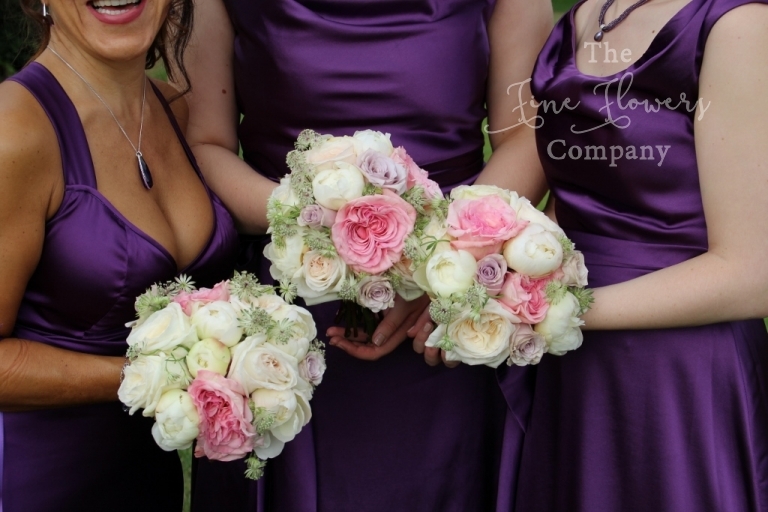 The touch of vintage pinky lilac Memory Lane roses gently softened the contrast against the bridesmaids deep plummy purple dresses and looked stunning. With the wedding flowers at Coworth Park’s ceremony, Tracy wanted to create a really dramatic and romantic aisle so a lot of details were chosen to achieve this. The 4 tall and 2 low martini vase guest table centrepieces were all used to line the aisle by placing them on our ivory plinths – a great way to get the most of your venue flowers through the day! 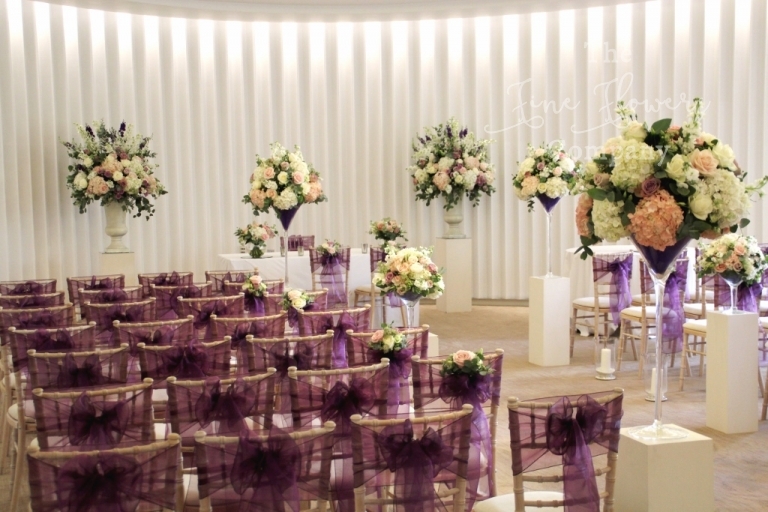 Chair end posies of flowers were used to decorate the chairs without plinths lined up against them and storm vases were used to line the aisle for romantic candlelight at floor level. Two more of the low guest table centrepieces were used on the registrar’s table, connected by pretty vintage votives and petal scatter. And of course, the all important ceremony backdrop was created by two amazingly grand country-garden style urn centrepieces packed with beautiful blooms: we used hydrangeas, delphiniums, astrantia and stocks, and beautiful silvery eucalyptus. After the ceremony guests were lead outside to the patio and beautiful meadow grounds, via the stairs decorated with foliage garlands and roses, with Coworth’s lanterns on the steps. Coming back into the oval room for the wedding breakfast, all wedding flowers at this Coworth Park wedding ceremony were used again, as table centrepieces. The guest table used a mix of tall and low Martini vase displays, while low displays were used to line the centre of the top table, for a more up-to-date take on a long & low display. The little chair end posies of flowers in little vintage vases, were used to add colour at table level on the tables with tall Martini vases. And all tables were finished off with our vintage mercury glass votives, available to hire. Finally, the entrance to the Oval room was dressed with two pretty bay trees and storm vases. If you are planning your wedding flowers at Coworth Park, please visit and take inspiration from our other Coworth Park venue pages with featured weddings at Coworth, or take a look at our other blogposts. 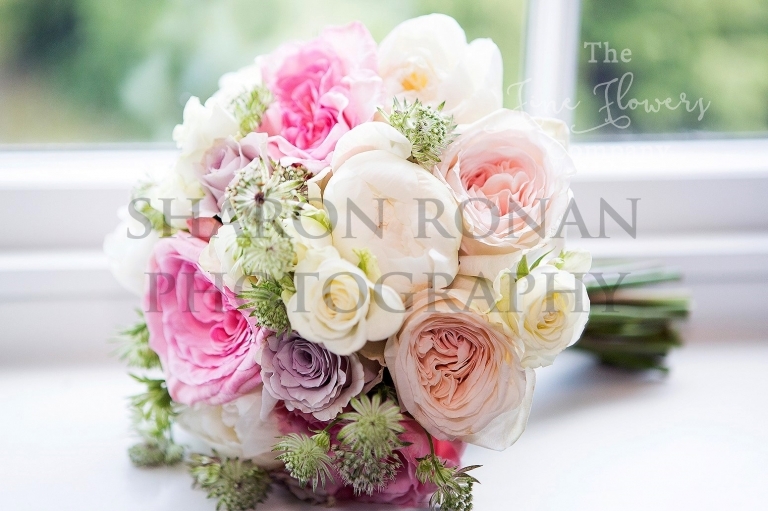 In the meantime, please see below some more photos from these beautiful wedding flowers at Coworth Park – the beautiful professional photography at this wedding is kindly supplied by Sharon Ronan Photography – please take a look at Sharon’s beautiful website.